This page shows specification and calibration of the CIRC. We have developed the compact infrared camera (CIRC) with an uncooled infrared array detector (microbolometer) for space application. The main mission of the CIRC is the technology demonstration of the wildfire detection using a large format (640×480) microbolometer. Wildfires are major and chronic disasters affecting numerous countries, especially in the Asia-Pacific region, and may get worse with global warming and climate change. In the Sentinel Asia project, which will share disaster information in almost real time across the Asia-Pacific region, wildfire detection has been chosen as one of the important activities to be monitored. Therefore, their early detection is important. Microbolometers have an advantage of not requiring cooling systems such a mechanical cooler, and is suitable for resource-limited sensor systems or small satellites. Main characteristic of the CIRC is also an athermal optics. The athermal optics compensates the defocus due to the temperature change by using Germanium and Chalcogenide glass which have different coefficient of thermal expansion and temperature dependence of refractive index. The CIRC achieves a small size, light weight, and low electrical power（★) by employing the athermal optics and a shutter-less system. Our aim is to realize frequent observations by loading CIRCs in as many satellites as possible by taking advantage of the CIRC. Two CIRCs will be carried as a technology demonstration payload of ALOS-2 and JEM-CALET, which will be launched in JFY 2013 and 2014, respectively. CIRC is an uncooled infrared array detector (microbolometer). Microbolometers are widely used in commercial and military applications. Their advantage is that they do not require a cooling system, such as a mechanical cooler. They detect infrared ray by converting minute changes of temperature to electrical signal when infrared ray comes into the detector. 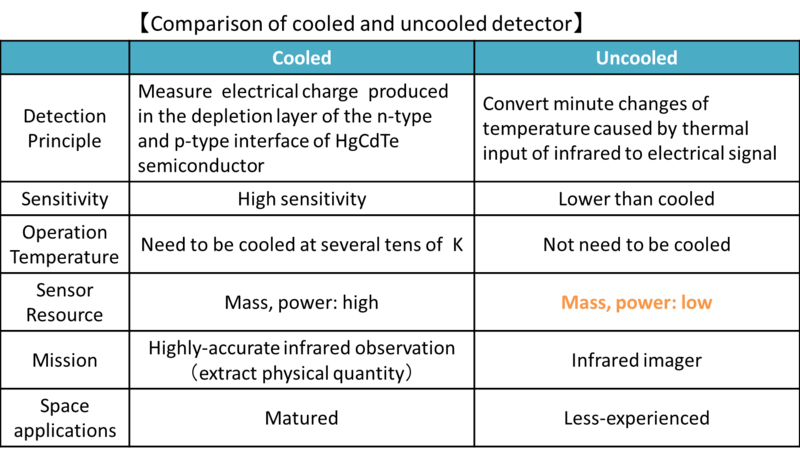 Although the sensitivity of a microbolometer is lower than that of an HgCdTe-based photonic infrared detectors, its advantage of not requiring a cooling mechanism makes it suitable for small satellites or sensor systems whose resources are limited. 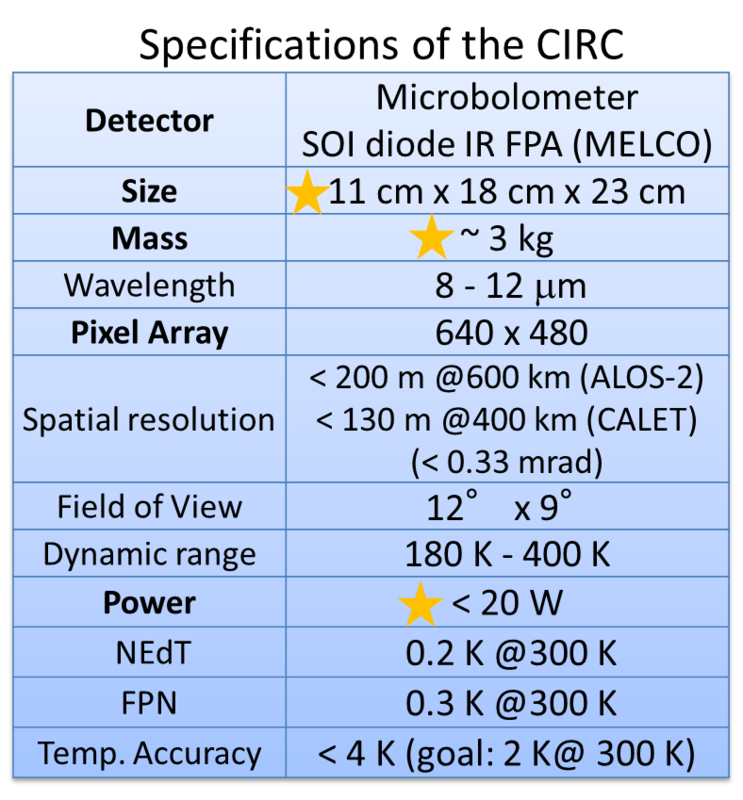 Although such uncooled infrared detector don't have much of a record for earth observation, it is just beginning to be extensively used for planetary exploration. CIRC has a largest format (640×480) for uncooled infrared detector of earth observation, and is also expected to be applied to multiple earth observation missions. Before launch of the CIRC, we carried out the ground calibration test of the CIRC PFM onboard ALOS-2 and JEM-CALET. As regards radiometric test, we confirmed noise equivalent differential temperature (NEdT), fixed pattern noise, and calibration accuracy. The stray light (i.e., the overall radiation except that from the target) has to be removed, because a dark image cannot be taken as a result of the shutter-less system. 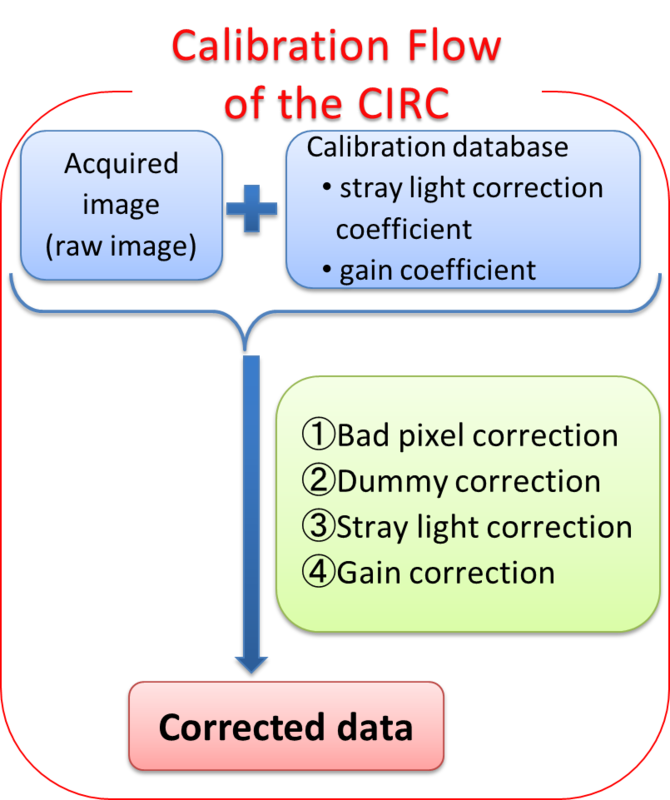 We constructed a calibration database (stray light correction coefficient and gain coefficient) and algorithm using blackbody images at various temperatures (-10 to 50 degrees C) obtained with CIRC PFM at various environmental temperatures (-15 to 50 degrees C). A flow chart of the data correction is shown in this figure. Calibration algorithm consists of four corrections. ①Bad pixel correction is to correct the brightness of a bad pixel, which is a pixel that has a brightness lower or higher than the surrounding pixels, by substituting the mean brightness of the normal surrounding pixels. 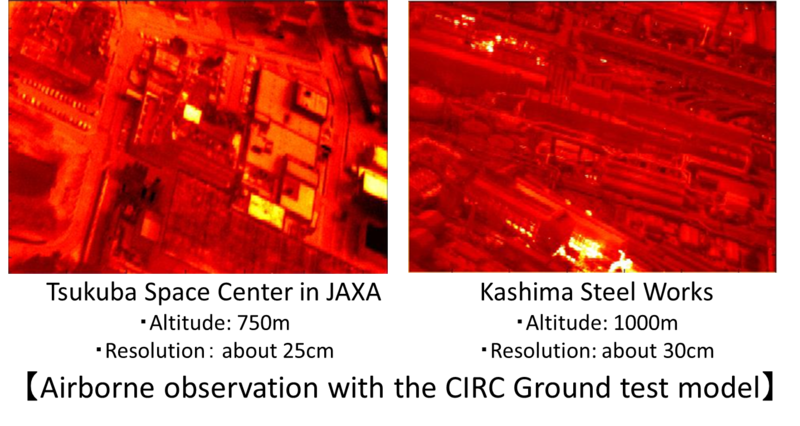 ②Dummy correction is to subtract the electrical background using dummy pixels which have no sensitivity to incident infrared rays. ③Stray light correction is performed for each pixel by using the stray light correction coefficient. ④Gain correction is to correct sensitivity and convert to radiance and temperature for each pixel by using the gain coefficient. Estimated NEdT and FPN of the CIRC onboard ALOS-2 result in 0.19 K and 0.27 K. Those onboard JEM-CALET result in 0.18 K and 0.21 K, respectively. These are the results expected from the design of the CIRC, and satisfied its specifications (NEdT: < 0.2 K and FPN: <0.3 K ＠300 K). The figure below shows a comparison between a raw image and corrected image obtained by the CIRC PFM for ALOS-2. Performing data correction makes it possible to capture smooth images without using a shutter system. The temperature accuracy is less than an average of 2.0 K in a comparison of the brightness temperature of the corrected image and the actual blackbody temperature. In the case of the CIRC PFM for JEM-CALET, the temperature accuracy is less than average of 2.8 K. Therefore, these results are within the specification. The main missions of the CIRC are observation of wildfire, volcanoes, and heat island phenomena. As for wildfire, we will monthly extract frequent areas of wildfire detections from results of previous wildfire data. While, volcanoes will be observed with a focus on the activity in Japan and overseas. About Heat island, it'll be observed around urban centerts in Japan. The spatial resolution and field of view are 200 m and 128 km×96 km from an altitude of 600 km in the case of ALOS-2. 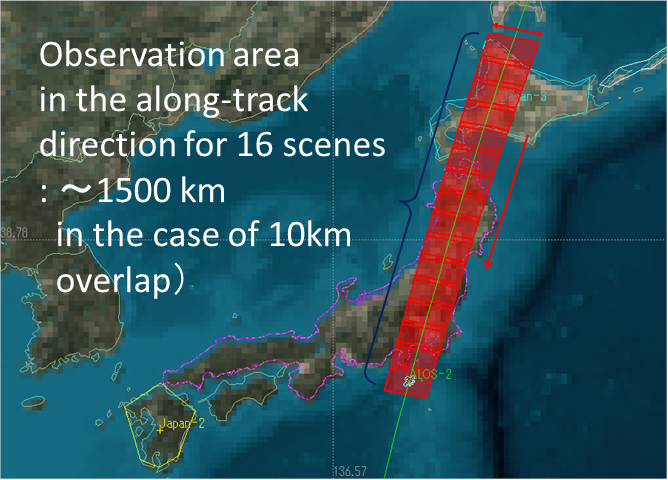 As shown in right figure of nominal observation, the CIRC permits the observation of about 1500 km in the along-track direction for consecutive 16 scenes. Observed scenes a day are also about 420 scenes. Average of observational frequency is two or three times a week for wildfire detection. As for volcanoes, that is about once a week. It is possible to increase the observational frequency if CIRCs are carried on various satellites.